The teams did another Do-It-Yourself-Reward challenge. Another day off for Jeff? The tribe divided up into 2 teams. Leif ended up on a team with most of the girls. That team lost. Tarzan, Alicia, Troyzan, Kat and Jay won a barbecue on a private island. Kim plotted to keep the women onside and vote all the men off, specifically targeting Jay and Troyzan as the next two. Chelsea was hesitant as she has ties to both of the men. This ticked off Alicia and Kat. Meanwhile, Jay and Troyzan targeted Alicia. Jay told Kat about the plan, and Kat made him believe that she was on board. I see bad things in Jay's future. Troyzan talked to Jay about the girls trying to pull a fast one on them because they have the numbers. Jay said he really, really, really, really doesn't see that happening. Oh yes, I see very bad things in this boy's future. The immunity challenge was the classic "hand chained to giant water bucket" game that Survivor has used before, complete with food temptations. Tarzan killed his bucket immediately. Surgeon, everyone. Christina was second out. Sabrina dropped out for 2 cookies and milk. Kim and Kat stepped down for cupcakes. Alicia dropped out for a bowl of candy and chocolate. After 45 minutes, it was Leif, Jay, Troyzan and Chelsea. Troyzan fell off. Jay stepped down for chicken wings and beer. The last supper, surely. Chelsea talked Leif into stepping down and he bought it like a fool and THEN HE SHARED HIS FOOD! So Chelsea won immunity. Kim asked the girls to split the votes between Troy and Jay in case Troyzan pulled out an immunity idol. Troyzan didn't trust Kim's repeated assurances that he was safe, and dug up his immunity idol and told Jay he was playing it. Jay confronted Kim about blind siding Troy, saying that Troy was playing the idol and four votes were coming Kim's way to get her out. 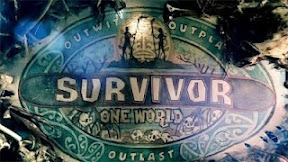 And now we have legit uncertainty (or, at least, carefully edited uncertainty) going into Tribal Council. Troyzan played his idol and Kim looked very nervous. But she had nothing to worry about as Jay was sent packing. Yup. Bad things in this boy's future.